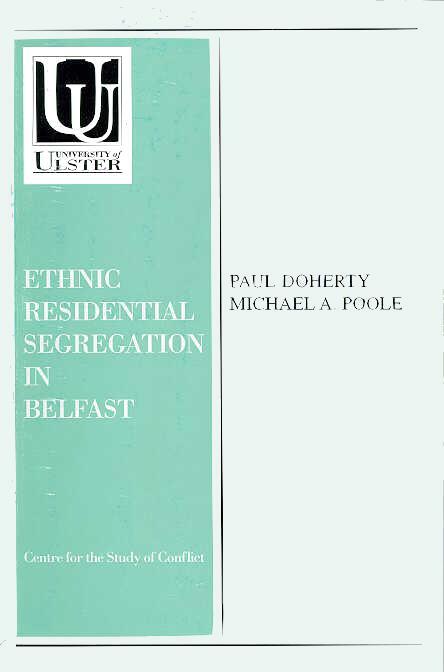 This new publication by Paul Doherty and Michael Poole is the first of a two volume study of ethnic residential segregation in Northern Ireland. This first volume deals specifically with the internal geography of Belfast. The second - which will be published later in the year - deals with the urban space of the province as a whole and thus also includes Belfast, but this time with only selected summary information and set in the context of all other towns. The authors have collected data on residential segregation for many years and most of the material presented here is new or reanalysed. This volume, and the volume on Northern Ireland as a whole which accompanies it (Poole and Doherty, 1995), should be viewed against the background of a not totally obvious paradox. On the one hand, religiously identified territory plays a fundamental part in the life of Northern Ireland people, so they have a keen awareness of the identity and boundaries of these territories. This implies that a knowledge of religious segregation is a virtually indispensable prerequisite for everyday life. On the other hand, these volumes would not have been written if the authors had not believed that very little is known about the intensity and extent of religious residential segregation in the province. Moreover, the contribution we are making is, we believe, not simply in that tedious academic tradition of quantifying the obvious - of measuring what everybody knows anyway. Instead, we consider that there are substantial gaps in knowledge which need to be filled, complexities to be unravelled, even myths which require to be exposed. It is reasonable to ask at the outset how people survive in Northern Ireland if knowledge of religious territory is, as we maintain, both so vital and yet so inadequate. The solution to this anomaly lies in the geography of everyday life. Individuals have enough localised knowledge for what they need to lead their largely localised lives. More specifically, certain aspects of living involve religious territory more than others - schools more than supermarkets, for example - and localisation is strong in relation to those aspects which most involve clearly defined territory. After all, most people, at any one time, have only a single home, neighbourhood, workplace, school or church: their lives are localised around these nodes, which form the environment for much of the more intimate social interaction which, as a consequence of this intimacy, requires a particular sensitivity to religious composition. However, this excellent localised knowledge of religious territory exists as a series of islands of information in what it is tempting to call a sea of Ignorance. This is probably too extreme an assertion, for people do have some generalised knowledge of geographical areas outside the pockets they know best. Nevertheless, it is probably true to say that very few people have a wide-ranging but detailed knowledge of religious territory throughout the province, and perhaps no single person has an extensive quantitative knowledge of this subject. Making such dogmatic statements about what people know is admittedly hazardous, and the authors would not wish to underestimate the tremendous fund of relevant information which exists, for example, amongst the activists within Northern Ireland's political parties. However, there are vested interests in restricting the circulation of such information, so there is no question of this data entering the public domain. Therefore, what we are alleging - and we shall bring evidence in the second volume to support the claim - is that neither the published literature nor the accessible unpublished data suggests that the public domain contains extensive, detailed, quantitative information on religious residential segregation in Northern Ireland. The perceived need to provide this type of information has stimulated a little specialised sector of Northern Ireland's academic world into publication, and, beginning with Evans back in the 1940s, this sector has particularly involved geographers. Almost all of these have worked at some stage in the Geography Department in the Queen's University of Belfast, though the diaspora from there has taken some of these academics to other institutions including the University of Ulster, where the authors of these two volumes are employed. From some writers, such as Darby (1976, p45), the work of this geographical school of study has drawn endorsement, but it has by no means aroused universal support amongst academic observers. For example, Smith and Chambers (1991, p374) group 'a number of social geographers' together with the Alliance party and the integrated-school movement as people who, they claim, all wish to de-emphasise the significance of ethnicity in Northern Ireland society in order to reduce conflict rather than adopting a more pluralist strategy which builds positively on the foundation of distinct ethnic identities. This seems a very curious criticism in view of the nature of the 'mutuality solution' proposed by the editors of the most important volume written by this geography-based school of thought (Boal and Douglas, 1982, pp.355-356). The school has also been attacked by 0'Dowd (1980, pp26-27) for an allegedly superficial interpretation of society which fails to recognise that "Geographical segregation is an expression of the (underlying) sectarian class relations." This is a puzzling non sequitur, especially since the intertwining of sectarian and class divisions, stressed by 0'Dowd, had been explored by Boal et al. (1976, pp114-121) via the concept of 'rankedness' and was developed further by Boal (1981b, pp64-66) in his model of social division within Northern Ireland. However, we make no apology for viewing our work as fully within the mainstream of the social geographic tradition criticised by Smith and Chambers and by O'Dowd. At the same time, we recognise that our contribution needs to be perceived and evaluated in the broader context of social science research in Northern Ireland. The task of viewing segregation with such a wider perspective has been tackled by some members of the wider social science community, including Darby (1976) and Smith and Chambers (1991) already referred to. We shall review their contributions later in this chapter, along with the work of the political scientist, Whyte (1990). This issue of setting segregation research in its broader context has also been addressed by the geographers themselves in the attempt to provide a rationale for their work, and it is with their own observations that we begin the following section on the justification for segregation analysis. Before commencing that section, however, there is a second aspect of the academic context which needs to be specified. Whereas the first aspect is parochial spatially by focusing on Northern Ireland - but achieving breadth by taking in the wider social science context - the second aspect has a narrow systematic focus by concentrating on measuring the intensity of residential segregation. This is an area of measurement which has developed as a specialist field in the last half-century, primarily within the disciplines of sociology and geography (Peach, 1975; Massey and Denton, 1988). Though this type of research, especially its ethnic subtype, has been spearheaded in the United States, its empirical scope has been reasonably global (Massey, 1985). This second aspect therefore provides a broader geographical context than the first by enabling our research to be set against an international background. By using a largely standardised methodology from sociology and geography, this initial volume is thus contributing towards the comparative empirical analysis of segregation intensity which is such a feature of this field (Lieberson, 1981, p79). This contribution will be indirect, however, by providing data for other investigators to make comparisons, for our own concentration will be purely on Northern Ireland. Indeed, the focus in this volume will be specifically on the single city of Belfast. By dealing with a single town as a case-study and subjecting its internal geography to segregation measurement, our analysis lies firmly within one of the great traditions of residential segregation research. This was the approach of Duncan and Duncan (1955b) in their pioneering study of occupational segregation in Chicago, as well as of Duncan and Lieberson (1959) in their early investigation of ethnic segregation in the same city. Subsequent American research, from Taeuber and Taeuber (1965) to Massey and Denton (1993), has, in addition, given considerable attention to the comparative analysis of many cities simultaneously, and that will be the direction pursued in our second volume. However, the focus of European segregation research has remained overwhelmingly on single-settlement studies, with an occasional comparison of a couple of towns (Peach, 1987). 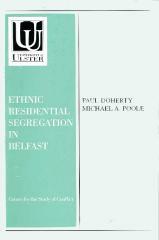 This means that the emphasis on Belfast, which has been so consistently apparent in Northern Ireland segregation research from the early work of Evans (1944) and Jones (1956) onwards and which continues in this volume, conforms totally to the principal model of European research on residential segregation. We begin our justification of the research reported here by considering the views both of those working in the province's social geographic tradition we have identified and of those outside but aware of it. Evans (1944, p25) drew attention to two reasons for his mapping of the distribution of religious groups in Belfast, and we shall see that these two observations encapsulate much of the content of the comment which followed in the next fifty years. The first of these reasons is simply that the subject is academically interesting, especially since it demonstrates the interplay between history and geography by virtue of the effect of the deep historical roots of the religious division on the contemporary geography of the city. The second reason is its "unfortunately deep significance as a force preventing full civic integration" and thus creating two communities instead of a single, united community. Evans was careful to add that residential segregation is only one of the many facets of social life which need to be studied in this context. If Evans, in this brief article, pointed the way for the study of the spatial distribution of religious groups in Belfast, it was Jones (1960b) who pioneered the trail itself with a highly innovative book on the city's social geography, including a detailed discussion of its religious residential segregation. Even ten years later, the evaluation of Boal (1970, p373) was that it "provided a more comprehensive urban geography of Belfast than is perhaps available for any other city of comparable size." It was in his journal articles from the same period, however, that Jones expounded at greatest length on the justification for studying segregation, and his reasons largely echoed those of Evans. In the first place, Jones (1956, p188) wrote that, in addition to his demonstration of the correlation between segregation and socio-economic characteristics, the main purpose of his segregation analysis was the classic geographical one of identifying subarea differentiation - in this case, within the city. This is both for its own sake and because "spatial relations are one essential in explaining social phenomena", thus making it an important precursor to sociological study. This stresses reasons for academic analysis in much the same way that Evans did, except that the latter emphasised the link with history rather than with sociology. The second way in which Jones echoed Evans was found in two other papers. In the earlier of the two (Jones, 1952, p209), the "far-reaching effects in the life of the community" of the city's religious divide were stressed, especially in relation to residential segregation. In the later paper Jones (1960a, pp103-105) conducted a historical geographic analysis of "segregation and its relation to social tension ", emphasising the response of segregation to religious conflict, especially to its violent manifestations: he argued that it intensified when violence raged but probably weakened in the intervening periods of relative peace. There was a difference from Evans in that the latter stressed the effect of segregation on social division, whereas Jones highlighted the effect of social division in general and of violence in particular - on segregation. Both writers, however, emphasised the correlation between spatial segregation and religious division, together with the social significance of this correlation for every aspect of life in the city. Expressed very simply, both writers adopt a two-pronged approach to justification, with one of these prongs suggesting that segregation is an interesting thing, while the other asserts that it is an important thing. These two explanations, in a variety of guises, have cropped up many times in the later period since Evans and Jones were writing. However, with the return of the political 'troubles' since the late 1960s, it is the view that segregation is important, rather than just interesting, which has tended to dominate, and Jones's 1960 reference to the relationship between segregation and conflict has been particularly strongly stressed. In fact, his specific point that the intensity of segregation increases in response to violence but weakens during temporary lulls was modelled and elaborated by Boal et al. (1976, pp97-98) for the period from 1840 to 1975. First, the immediate problem of physical violence and conflict is, with the exception of bomb explosions and armed robberies, strongly concentrated in the highly segregated parts of the city: conflict between the two religious groups tends to take place at the boundaries where segregated Catholic and Protestant areas adjoin, and conflict between either religious group and the security forces usually occurs in the heartland of a segregated area occupied by the civilian group involved. Secondly, the long-term task of attempting to achieve social integration between the two religious groups is clearly rendered extremely difficult by the lack of residential mixing which would provide at least one opportunity for people from the two sides of the religious fence to meet and interact in a non-violent way. Without such residential and social mixing, there is little contact between the two religious groups but a high level of contact within each group, thus consolidating each groups solidarity and conformity and accentuating the differences, both actual and perceived, between the two groups. (Poole and Boal, 1973, pp2-3). This quotation suggests that residential segregation both influences the geographical location of violence and helps to cause what Boal (1969) elsewhere called 'activity segregation': this is the separation of social groups at non-residential nodes like schools and workplaces. Activity segregation, in turn, in this view, is held to make conflict more likely by fostering division and hence hostility. This reference to the simultaneous functioning of residential segregation as both cause and consequence of violence is a neat summary of the arguments of Jones, Boal et al. and Poole and Boal quoted earlier. However, it is the consequences of segregation which Darby goes on to give most attention to, and he makes a very useful distinction on the basis of geographical scale-level. At a macro-level, he points out that what he calls 'the politics of population' has played a fundamental role in influencing the direction of political affairs, including even the determination of the size and boundaries of the basic Northern Ireland entity itself. At a more micro-level, Darby suggests that "it is often religious segregation, especially in towns, which converts distrust and dislike into violence," pointing out that those towns without significant religious residential segregation were also towns with a low level of political violence. Whyte (1990, pp34-35) also outlined the effects of residential segregation, but he did not use these specific effects to justify the discussion of segregation. Instead, he used the consequences of religious segregation in general - residential and in its other forms - to justify his analysis of the wider topic. Segregation, he argued, was important because it created separate communities "largely ignorant of each other and susceptible the therefore to prejudice and stereotyping" (Whyte, 1990, pp50-51). This, in turn, enabled segregation to accentuate tension in a situation which is already ripe for conflict for other reasons. Thus, although Whyte argues, from international evidence, that segregation does not, on its own, produce conflict, he does submit that it plays an important contributory part in the process of conflict-generation. Whyte (1990, pp2, 26) also proposes a second, and quite different, justification for segregation analysis. He was trying to assess how accurate it was to claim that the Northern Ireland population was divided into two distinct communities, and he partially tackled this problem by evaluating the extent to which the province was segregated by religion into these two blocs. Residential segregation was simply one of the many aspects of life which he examined for evidence of segregation, along with church, school, workplace, recreation and marriage. This approach is reminiscent of the earlier work of Poole (1982, pp281-282, 305), who, in the attempt to perceive residential segregation in appropriate context, stressed that its intensity was far less severe than either the segregation in Northern Ireland schools or the religious division in its voting behaviour. The justification used by Smith and Chambers (1991, p26) in relation to their evaluation of the residential segregation work is of a totally different type from those of Darby and Whyte. It is really that they were simply following the mandate laid down for them by the Standing Advisory Commission on Human Rights (1987, p2), who hired the Policy Studies Institute to undertake research on discrimination and inequality in Northern Ireland. One of the objectives designed by SACHR was interpreted as "to show how far inequalities arise because the two groups occupy different territory, both physical and social. " Thus what might superficially appear to be evidence of discrimination could simply be the result of the geographical distribution of the two religious groups, and some well-known examples are quoted with respect to employment (Smith and Chambers, 1991, p99). These are not, in fact, hypotheses with which these authors are very sympathetic, and they argue strongly against them in their conclusion (p374). It should also be added that the relationship studied between segregation and inequality is related to conflict insofar as Smith and Chambers (1991, p57) contend that inequality is as integral a part of the conflict as is identity. Therefore, their conclusion that segregation is only weakly related to inequality also implies that it is not an important cause of conflict, at least via the role of inequality. Of all these analysts of the Northern Ireland scene - geographers and non-geographers - the one who has simultaneously made the greatest contribution to segregation studies in a wider spatial context is Boal, especially through the medium of two indispensable review papers (Boal, 1976, 1987). Interestingly, Boal is not explicitly concerned to provide much of a justification for segregation analysis in either of these publications. The closest he comes is a passing comment in the later paper that "these patterns are inherently interesting and, more importantly, in that they are both reflective of and contributory to broader social change" (Boal, 1987, p118). This is, in fact, the two-pronged argument of Evans from forty years before. However, Boal is strongly concerned both to provide interpretations of the meaning of segregation and to discuss its policy aspects. It is through these interpretations and policy-related comments, as incorporated in the 1976 paper, that a more elaborate justification can be inferred. The interpretation he alludes to is the tendency of many authors to use such segregation as a general 'indicant' of the overall relationship between a pair of ethnic groups - and especially as an indicator of a lack of assimilation (Boal, 1976, p41). In fact, Peach (1975, p1) contemporaneously based his book of classic segregation readings on the similar hypothesis that spatial segregation is positively correlated with social distance - and therefore negatively correlated with assimilation. Both Boal and Peach cite the work of Duncan and Lieberson (1959), who emphasised that assimilation is not only a complex concept but one whose individual dimensions are difficult to measure satisfactorily, whereas residential segregation could easily be expressed by readily computed indices applied to standard census data. This strategy therefore employs residential segregation as a surrogate for an entire bundle of assimilation dimensions. Since the assimilation of an ethnic group into the wider society implies a corrosion of the distinctive ethnic identity of the group, it follows that the use of residential segregation as a surrogate for the complexities of the assimilation concept also implies its employment as a substitute for the strength of perceived self-identity. This interpretation of residential segregation as a surrogate for social identity - particularly ethnic identity - presumably explains why Boal does not explicitly justify the study of segregation in this paper. This is because, once it is established that ethnic residential segregation is a surrogate for ethnic identity, no further justification is required since ethnicity is self-evidently a vitally important component of social structure. Boal's second indirect reference to justification in 1976 is via his discussion of policy issues. He makes clear his disapproval of simplistic universal integrationist policies - despite the subsequent comment of Smith and Chambers, noted earlier - and he emphasises the policy-relevance of identifying whether particular cases of segregation are voluntary or involuntary and whether they are a by-product of class segregation (Boal, 1976, pp74-75). For example, it is harder, on social policy grounds, to be critical of voluntary segregation - as long as it is demanded by both of the groups involved. We argue that, if a topic has such a social policy dimension, as the literature references to residential segregation clearly indicate it does (Goering, 1986), then it is self-evidently important enough to discuss. This provides a further explanation of why Boal provides so little explicit justification of the attention he pays to residential segregation. Clearly, the authors of this volume believe that it is justifiable to study residential segregation otherwise, the document would not have been written. At the same time, they would argue that it is important not to overstate the case for analyses of this type. Therefore, it is necessary to accept that there are limitations to this form of analysis, and it is to these that attention must now be turned. Some of these limitations were highlighted in Boal's 1987 review paper, for he argued for a widening of the perspective well beyond residential segregation alone to examine the many diverse aspects of activity segregation. He also called for more integrative studies, especially by participant observation, of all aspects of segregation simultaneously. These priorities have also been emphasised more recently by Grimes (1993, p104), who pointed out both that a plea for it had been made as long ago as 1969 by Boal himself and that this old 'challenge' has been singularly neglected in the literature. In fact, it could be argued that certain aspects of activity segregation have been very well researched indeed. In particular, the focus on the school node in the individual's activity system has generated a massive amount of research on segregation in the education system. This is especially the case in the United States, where the issue of 'racial' segregation in schools has been such a contentious policy issue (Farley, 1978; Rivkin, 1994), but the field has also been closely investigated in Northern Ireland (Murray, 1985; Doherty, 1990a; Dunn and Smith, 1995). An equally controversial issue in the Northern Ireland context has been workplace segregation, and, though this has not generated the same amount of quantitative measurement as American school segregation, there is a substantial policy-oriented literature on, for example, the religious composition of both occupational categories and the unemployed as well as that of the workforce of specific employers (Bertsch, 1991; Cormack and Osborne, 1991; Gallagher, 1991). In addition, there is an annual publication of quantitative monitoring data (Fair Employment Commission for Northern Ireland, 1993). On the other hand, the more informal nodes involving recreation, friends, relatives and neighbours have been given far less attention, and, partly as a result, the more holistic studies of segregation for which Boal calls have also been neglected. Social anthropology has partially filled this gap, but in a perhaps inevitably nonquantitative way which inhibits geographical comparison (Donnan and McFarlane, 1983). Grimes's interpretation of Boal's plea for more studies of activity segregation was as evidence of a 'growing disillusionment' with descriptions of residential segregation. Certainly, Grimes himself was anxious to express disquiet with studies which limited themselves to such descriptions: he expressed a preference for the orientation of some Australian work, for example, which combined residential segregation measurement with investigations both of the migration and adaptation processes and of interaction networks (Grimes, 1993, pp104-105). Above all, however, Grimes was determined to counter the view, as promoted by Peach, that residential segregation was a good predictor of the two related concepts of social interaction and assimilation. He alleges that too many residential segregation studies "have accepted in an unquestioning way unproven assumptions ... regarding the insights into social interaction afforded by residential patterns." And he claims that the preoccupation with the measurement of residential segregation was strongly influenced by outdated 'assimilationist ideology' (Grimes, 1993, p117). This implies that assimilation between the religious groups in Northern Ireland is not only unlikely but undesirable because it would not respect the values of the two traditions. Therefore, an assimilation-based interpretation of segregation in the province would be misleading, and a justification of its analysis in those terms would be inappropriate. This, we believe, makes it no more than interesting to note the assimilation-based justification for so many segregation studies, for it has very limited relevance to the Northern Ireland case. Even more important, the attack of Grimes on assimilationist ideology, which is also interesting as a commentary on his Australian segregation analysis, is therefore of limited relevance to the Northern Ireland conflict situation. The assimilation issue is therefore neither a justification for, nor a limitation of, residential segregation analysis in Northern Ireland. Next, we turn to the implied justification arising out of Boal's discussion of segregation policy, which emphasised the need to differentiate voluntary from involuntary segregation. Unfortunately, there is immense difficulty, in practice, in distinguishing these two, as Boal himself pointed out. One reason is that, if a city's housing market consists almost entirely of, for example, religiously segregated neighbourhoods, then a Catholic decision to live in a Catholic district is, in one sense, voluntary because the options rejected are Protestant districts the mover is reluctant to enter. At the same time, if the decision-maker's optimal preference is for a mixed neighbourhood which the segregated system prevents from existing, the mover is, in fact, being constrained against their will to live in a Catholic district by the limited options available. Thus the choice of neighbourhood may be simultaneously both voluntary and involuntary, and we cannot identify the involuntary segregation which is the actual rationale for having an anti-segregation policy and, thereby, for performing segregation measurement. However, the fact that choices can be simultaneously both voluntary and involuntary only arises because of the segregated system which offers an inadequate choice of mixed environments. The real issue, therefore, is whether there is a sufficient range of alternatives in the housing market to make a genuinely voluntary decision possible. Boal himself stressed the importance of choice as preferable to a policy of forced integration for ethnic minorities, but we go further by arguing that such choice for individuals demands that there be available a wide selection of actual environmental alternatives. After all, if the only alternatives for, say, a Catholic are living as part of the majority in a highly segregated Catholic neighbourhood or as part of a small minority in a dominantly Protestant area, then there is not a great deal of real choice. Consequently, although it appears that the difficulty of differentiating voluntary from involuntary movement is a serious limitation to this policy-oriented argument for justifying segregation analysis, this is only a superficial view. What is more important from a policy perspective is whether there is a sufficient choice of a wide range of social environments to make a voluntary decision possible. This is a major justification for segregation measurement, for only empirical analysis of the latter type can express the range of real choices available. We have therefore dismissed the assimilation-based justification for residential segregation analysis in Northern Ireland, but the policy issue provides a powerful justification. That still leaves for consideration, however, the more locally-inspired justifications. Leaving aside the issue of interest - which is probably uncontroversial if perhaps a little unfashionably self-indulgent - that leaves the argument related to the link between segregation and violent conflict. Without going into any great detail, this proposition seems, in fact, well-supported by the evidence - both as regards the effect of residential segregation on the geographical location of violence (Poole, 1983, 1990) and in relation to the impact of violence on segregation via the flow of refugee movement (Darby and Morris, 1974). Firstly, in relation to the effect of segregation on political violence, a very considerable variation in the level of violence has been demonstrated to exist between different Northern Ireland towns. And this variation has been shown to be closely correlated with certain aspects of religious residential segregation - specifically, with what was described as the size of the Catholic ghetto population. This was defined as the number of Catholics living in neighbourhoods which were themselves 90-100% Catholic (Poole, 1990, pp73-76). For example, Belfast was found to be both an exceptionally high-segregation town and a remarkably high-violence town in the Northern Ireland context. This work only established a correlation between segregation and violence: it did not prove that the former caused the latter. However, this was deemed a plausible explanation because preliminary research suggested that the segregation, where it occurred, considerably predated the violence. Nevertheless, violence is certainly capable of accentuating segregation, as the previously quoted model of Boal et al. (1976, pp97-98) suggested, and this brings us to the second element of the violence-segregation relationship. The quarter-century of violence after 1969 has been the cause of considerable refugee movement - but overwhelmingly in the first half-decade of the troubles. The major investigation of this movement was by Darby and Morris (1974), augmented later by Darby (1986). These sources demonstrate the variety of violence-related stimuli to refugee flows - including both individual and general threat and fear of intimidation, as well as actual physical violence. Where the flows occurred, they caused a strengthening of the religious heartlands and the homogenisation and shrinkage of mixed neighbourhoods - what, in the 1990s, would be called 'ethnic cleansing' (Ahmed, 1995). The result was, of course, an intensification of religious residential segregation. Therefore, although there are limitations to some of the justifications discussed for the study of religious residential segregation in Northern Ireland - especially those involving assimilation - it is clear that there remains considerable need for this type of research. This applies both to the conflict-based justification which has its roots in the reasoning of Evans and Jones and to the policy-based argument stemming ultimately from the observations of Boal. The preceding debate on the justification for, and the limitations of, segregation research necessarily involved discussion of the effects of residential segregation - notably on violent conflict. However, it is beyond the scope of either this or its companion volume to provide a detailed report on any specific research into these effects. Neither is it our intention to say much about the causes of segregation, beyond some simple explanatory comments to shed light on the geography of the patterns identified. Again, a comprehensive analysis of the causes of residential segregation, which would require, inter alia, an in-depth historical investigation, needs data of a kind not available to the authors. This effectively prevents any attempt to clarify the processes generating and reproducing segregation that we would ideally make to reach a deeper understanding of the topic (Waldorf 1993). Instead, we shall target our analysis on the measurement of segregation as an investigation of intra-urban spatial pattern. Therefore, the research presented here is a continuation of an old tradition in social science research, focusing on the measurement of the intensity of residential segregation. It is hoped to extend the work at a future date to a more profound analysis of cause and effect, but, even within the relatively limited field of pattern analysis that we concentrate upon, much research still remains to be done. This involves not only replicatory studies extending pioneering work in both time and space, but also more innovatory investigations. For example, Boal (1987, p120) concluded his review by stressing the need "to earth our work in the material and social worlds, by means, if at all possible, of methodologically inventive investigations." The second of our two volumes attempts to address this plea for methodological innovation, both for its own sake and to illuminate the empirical analysis attempted there. Methodological issues are given less emphasis in this first volume, though there is one such issue discussed in depth here. This is the use of the local population census to derive data on ethnic identity - a question fundamentally important to so much social scientific analysis in Northern Ireland. The primary focus in the current volume is, however, empirical, and its basic purpose is to provide comprehensive quantitative information on religious residential segregation in Belfast, though not by presenting a huge mass of raw statistical data. Instead, the focus of attention will be on the processing of that data to generate indices measuring the intensity and extent of religious residential segregation. Such indices are much easier for the reader to assimilate than the massive amount of raw data which they essentially summarise. This fundamental aim spawns several subsidiary objectives, which are considered necessary to the fulfilment of the dominant one. Four are specified in the following list. A review of the segregation literature on Belfast. There is a considerable, but rather scattered, literature on religious residential segregation in Belfast, and it seems a useful function to draw it all together into an integrated whole. Moreover, this should identify knowledge gaps to be filled in the published descriptions, though it has to be said that the problems of inadequate information and serious misconception are much less severe in Belfast than in the smaller towns of Northern Ireland to be examined in the second volume. Therefore, the main purpose of this literature review is really to help provide an historical perspective on the development of segregation in Belfast, thereby providing the necessary context for an understanding of the contemporary situation. A detailed analysis of segregation in contemporary Belfast. Most objective segregation research in Northern Ireland has been carried out on the province's primate city of Belfast. This could have persuaded us to ignore Belfast in our research on the grounds that so much had already been written about it. Instead, however, we take the view that the knowledge of this city needs to be up-dated and that it needs to be seen in the comparative context both of time and of space - the latter involving a comparison with other towns in Northern Ireland to be provided in our second volume. Therefore, we shall not only review the existing literature on the intensity of religious residential segregation in Belfast, but we shall subject it to fresh quantitative analysis. An analysis of segregation change and stability over time. The quantitative analyses of contemporary Belfast will use up-to-date information from the 1991 census. In addition, however, we propose to extend the analysis backwards in time so that the development of segregation can be inferred from data at a series of cross-sections through time. Some of this historical material will be from the nineteenth century or earlier, but most will be drawn, by necessity, from a series of dates throughout the twentieth century, and in particular from the 1971 and 1981 censuses. From this material, we aim to identify how much change and - crucially, in our view - how much stability there has been in segregation intensities. A consideration of the use of religion as an indicator of ethnicity. In this introduction we have spoken primarily of religious residential segregation, but we subscribe to the position long promoted by Boal that the division in society in Northern Ireland is basically ethnic, and that religion is simply a key indicator of that division. Both the volumes in this set utilise statistics on religious affiliation, but these are employed as indicators of the more fundamental division. While religion is a good indication of ethnic identity in Northern Ireland, it is not perfect, and there are problems associated with the use of religious statistics from the census. These are issues which need to be addressed, and their impact on the measurement of residential segregation will be assessed in this first volume. Meeting these four objectives, we believe, is of relevance both for a local audience, which already has a deep knowledge of its own territory, and for that community of scholars, local and international, who have contributed so much to researching the social divisions of Northern Ireland. The opening chapters of this volume have traced the troubled history of Northern Ireland's major city, focusing on the relationship between residential segregation and violence, in the form of rioting, intimidation and public disorder. Several clear empirical points emerge, some of which have previously been noted elsewhere but which are nonetheless worth repeating here. Firstly, this is a system of considerable stability (Boal, 1981b). Residential segregation in Belfast is not a new phenomenon, but, as has been shown, it has been in existence since the birth of the city. This stability derives from inertia in the system: once segregated areas develop, they tend to be perpetuated by what may be termed normal residential mobility processes within the housing market. Thirdly, the overall trend in segregation as revealed by the various indices presented to the present day is upward. It has been suggested (Boal et al., 1976, p98) that the relationship between conflict and segregation follows a cyclical pattern: periodic outbursts of violence result in a rapid response in the segregation system. Subsequent decline in overt conflict is followed after a time lag, by a gradual diminution in residential segregation. This model implies an oscillating level of segregation, around some 'average' value, and that increases in segregation are subsequently matched by compensating downswings. However, while it is true that conflict is followed by increased segregation, there is no real evidence in the Belfast experience to suggest that after the violent episode ends the segregation returns to its previous level. The years 1935 to 1968 were identified as a period without major confrontation, but during this period segregation levels remained high, and between 1937 and 1961 the D value declined by only 1.5 percentage points at ward level. Table 5.1 shows a D value of 44.9 for the 15 wards for census night in April 1971, before the massive population movements of that summer, but the segregation levels still had not fallen back to what they had been in 1911. This leads to the conclusion that while segregation falls when there is no conflict, it does not fall back to where it had been before the preceding outbreak of violence, and therefore the overall trend is inexorably upward. Rather than witnessing an oscillating level of segregation, we in fact see a ratchet effect in operation (Smith and Chambers, 1991, p112), by which segregation rises in a stepwise fashion, only falling back slightly after an extended period of tranquillity. Fourthly, speaking at a symposium in 1980, Boal suggested that the period from 1969 was significantly different in two ways: open ethnic conflict had continued for longer than ever before, and previous outbursts were not contemporaneous with urban renewal and the widespread availability of public sector housing (Boal, 1981b). Fifteen years later, the length of the conflict is if anything an even more significant factor. Segregation levels have been shown to be at an all-time high following a conflict of unprecedented length and intensity. Earlier this century a period of 25 to 30 conflict-free years elapsed before a slight decline in segregation levels could be observed, and it must be expected that a similarly lengthy period must go by before there is any significant desegregation. Focusing now on the years 1971 to 1991, this period has been the most traumatic in Belfast's history, both in terms of the direct impact of the Troubles on its citizens' lives, and in terms of the population movements that have been directly or indirectly influenced by them. The city has in addition been subject to the more normal processes of urban population change and redistribution. The overall outcome of these forces has been a city that has seen an overall decline in population, particularly marked in the inner city, but with strong population growth in Newtownabbey and Lisburn where there has been substantial housing development. This change in population numbers has been accompanied by a change in ethnic composition, with the Belfast Local Government District becoming more Catholic, while the suburban areas have become more Protestant. However while there has been a marked increase in the proportion of Catholics in the LGD, they still predominate in only a comparatively limited area in the west of the city. Catholics are more likely to be living in areas where they are in the minority, and are also more likely to be living in mixed areas. The eastern part of the Urban Area has strengthened its Protestant numerical dominance. These changes in ethnic composition have led to an overall increase in residential segregation within the Urban Area. Most of this increase took place in the decade 1971-81 when the Troubles were at their most intense, and when large scale forced population movements occurred. However the experience of the different parts of the BUA has varied considerably, and no clear pattern of change is evident. The highest level of segregation, with the exception of some peripheral new-build areas outside the Stop Line, is in Belfast West. High levels are also found in the LGDs of Lisburn and Castlereagh. Both Lisburn and Newtownabbey have experienced population growth and a strong increase in segregation, but while Lisburn has become more Catholic over the twenty years, Newtownabbey has become more Protestant. Belfast East and Castlereagh which were already Protestant areas have both become even more Protestant, and have also experienced increasing segregation. The Belfast Inner area has undergone very substantial population decline and inner city redevelopment, becoming more Catholic in the process. The lowest levels of segregation are found in the more middle class areas of Belfast South and Holywood. In Belfast South the level of segregation has remained static even though the population balance has become more Catholic. Holywood, which is not strongly connected to the rest of the BUA and which has always been quite distinctive in its experience of residential segregation, has had a slight fall in its proportion of Catholics, while its D value has dropped to an even lower level. Looking at the P* indices which provide a measure of the social isolation of the two communities over the twenty year period, two basic features are found in the BUA as a whole. Firstly, the P* values for Protestants are high and have changed little, and secondly the values for Catholics have changed in the direction of increased isolation. Examination of the indices for the different areas confirms these observations, and provides a little more insight. The P* indices for Protestants are high in all areas, only falling below 0.70 in Belfast West. In the East and in Newtownabbey, which have become more Protestant over the time period, the pP*p values have risen slightly, indicating an even higher probability of Protestant meeting Protestant. In Castlereagh and Holywood, the pP*p values remain constant. In both these areas the proportion of Catholics has fallen very slightly. But in all other areas - Inner, North, West, South and Lisburn - the pP*p values have fallen, and all these areas have experienced an increase in the proportion of Catholics. We can conclude therefore that if the proportion of Protestants in an area rises, Protestants become even more isolated. If the proportion stays fairly constant, they remain at the same high level of isolation. If the proportion of Catholics in an area increases, the Protestant isolation levels fall, but remain high. However for Catholics the experience has been different. With only two exceptions, the cP*c values have risen in all areas, including those areas which have become more Catholic. In some areas the rise has been substantial, in particular Lisburn (from 0.19 to 0.60) and Belfast North (from 0.35 to 0.56). The two areas which have not seen rises in cP*c are Belfast West and Holywood. In Belfast West, the already high value remained constant. In Holywood, there was a slight drop in cP*c, confirming Holywood's standing as an area of low segregation. At the end of the twenty year inter-censal period, we can conclude that Protestants remain highly isolated from their Catholic counterparts, while Catholics, who started the period with lower P* values, have become more isolated, more likely to meet fellow Catholics and less likely to encounter Protestants. We can also observe that the mechanism of segregation has remained unchanged to the present day: members of the minority in a district are intimidated from their homes, or leave because they feel insecure. The Report by the Commission of Inquiry into Riots in Belfast in 1857, and the report by the Community Relations Commission into the 1971 riots have already been quoted as providing examples of that mechanism. We conclude this empirical summary with a contemporary illustration. As this volume was in preparation, inquests were held into the deaths of two Catholics who were murdered on separate occasions in 1993 at their homes in different parts of predominantly Protestant East Belfast. Mr Leckey said: 'I cannot help but conclude that these attacks were to engender fear among other Roman Catholics living in the same area with a view to making them leave the area. There does not appear to be any other reason at all. In both cases these were mixed communities where relations were good and what happened must have been very frightening for all of those living in the area." (Belfast Telegraph, 22nd June, 1994). Finally, we come to the methodological issues addressed. One which received no more than passing attention, because of the desire not to dwell too long on technical matters, was the problem of geographical scale-level. The subareas used in the analysis were wards and kilometre squares, and both are so large that it frequently had to be pointed out that apparently mixed subareas at these levels might well be internally segregated. Thus micro-level segregation could be masked by the coarseness of a spatial mesh comprised of wards or kilometre squares. This qualification certainly does not invalidate the macro-analysis of this volume, for the macro needs to be measured just as much as does the micro - no more, no less (Poole and Boal, 1973, p7). However, there is a need to supplement the work presented here with an analysis of smaller spatial subareas such as the enumeration districts for which data is now released in a Small Area Statistics package from Census Office. The companion volume to this one will, in fact, switch the focus to a more micro-level of segregation analysis to help achieve an overall balance. The principal methodological problems which did receive more than simply passing attention in this volume were those associated with the use of religion as an indicator of ethnicity. It was explained that these are not problems which arise because substantial numbers of people do not state their religion or indicate that they have no religion. We have examined the impact of this on the measurement of segregation by experimenting with alternative ways of classifying these problematic groups. The basic objective of the experiments has been to identify whether the people involved are ethnically Protestant or Catholic. Our conclusion has to be that it is inappropriate to apply a consistent methodology to deal with this problem in the same way in all three difficult census years. The use of such a strategy to analyse the ward-level data led to the need to make a number of significant qualifications, especially when interpreting the 1981 material. Therefore, it is better to design a customised methodology for each of the three censuses, such as that we applied to the grid square analysis. Our approach there may still have been too simple, and a more complex methodology could have been devised for each year, but the results still suggest substantial success in handling what is ultimately an intractable problem. In searching for a solution, attention must be particularly focused on the census of 1991, for, at the time of writing, it will be several years before its results are replaced by those of 2001 as a source about the population of Belfast. Compton is of the opinion that the bulk of both the non-statement and the claims to have no religion in 1991 were Protestant, and he has estimated population numbers for the two groups on the assumption that there is no systematic bias caused by Catholics being more reluctant to state their religion in majority Protestant areas and vice versa (Compton, 1995). Our discussion in the previous chapter has tended to agree with this, with the exception of Belfast West. However, examination of the spatial pattern of non-response in Belfast suggests that this is not a straightforward matter, and that other factors such as social class may be in operation. We do not actually know why some persons do not state their religion on the census return. It may be that they feel this is not a proper area of inquiry by the Census Office, or they may not wish to divulge their religious affiliation out of fear associated with the situation in Northern Ireland, or they may not have any meaningful place for religion in their lives. Whatever the reason, non-statement of religion has posed a problem for the last three censuses, and this is a research issue which now needs to be addressed. We must examine available census material more deeply, including the Sample of Anonymised Records and the Small Area Statistics, for indications as to who the non-respondents are. Similarly, there must be a research effort aimed at discovering who, in terms of ethnic identity, are the people who state they have no religious affiliation. If we are to continue using religion statistics in the way in which we have done in this study, we need a clearer understanding of these issues. Moreover, ethnic monitoring has now become an integral part of public policy in Northern Ireland in response to the conflict situation (Department of Economic Development, 1989, pp 16-24), but meaningful monitoring requires reliable data to provide a benchmark for evaluation. It is highly ironic that, just as such monitoring has been embraced, the shift in the way the public answers the religion question is making the census less capable of delivering unambiguous data to establish the benchmark. Failure to solve these problems could cause serious difficulties with the analysis of future censuses and could gravely undermine the public policies dependent on such analysis.